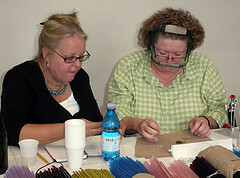 Beadventures started in 1994 with weekend beading retreats in Arizona. The company now offers international travel to over 14 countries with many talented teachers and experts in the field of beadwork, beadmaking, fiber arts, and more. Creativity, sparked by culture and nurtured by talented teachers is what Beadventures is all about. 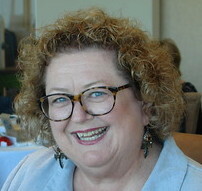 In January 2009 Cheryl Frasca of Anchorage, Alaska took on owenership of Beadventures from Cheryl Cobern-Browne, who now spends more time at the wonderful retreat center ( Essence of Mulranny) that she has built in Ireland. Cheryl F. had been on several Beadventures, including Ireland and Italy pictured here, prior to her taking over the company. 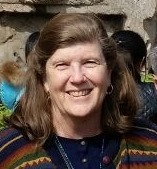 She serves as tour leader for Beadventures to her home state of Alaska. The fun of these experiences--and the great friends she has made--is what convinced Cheryl F. to take on ownership of Beadventures. Cheryl has been beading since the late 1990s. While she will occasionally dabble in fiber and other mediums, seed beads are her favorite--especially free form bead embroidery. She retired from public service (30+ years working for elected officials on Alaska budget/fiscal policy) in 2012. She now does consulting and volunteer work so she can maintain "flexibility of schedule" that allows travel. Doris leads our trips to the Czech Republic and to the warehouses of vintage crystals and beads in Providence, Rhode Island. Doris has added London to her portfolio starting in 2018. Doris went on the very first Beadventure and was immediately hooked! Doris owns Dee's Place and teaches classes around the country. Maggie leads all our trips to Italy--as well as other destinations as requested! She began beading after “coveting” a pair of earrings worn by her son’s teacher. Maggie signed up for a bead class and has never looked back! A move to Naples, Italy in 1998 changed her life forever. The rich, lively culture of the Neapolitan people and the ancient mosaics, frescoes, and jewelry designs are a major source of inspiration for her designs. She has studied at the Mosaic Art School in Ravenna, Italy and learned the ancient traditional methods of creating mosaics. This has added to Maggie's unique ability to create beadwork translated from the designs of frescoes and mosaics seen on the floors and walls of abbeys, monasteries and ruins. 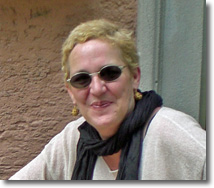 Maggie teaches workshops nationally and internationally in Turkey, Germany, and Italy. Her work has been shown in Milan and Naples and has been featured in BEADWORK Magazine, BEAD & BUTTON Magazine along with others. Her first book, " Classical Elegance," was released in Augusut 2011. Maggie also was featured in in a Home & Design article " Art Studio: An Ancient Craft." Learn more about Maggie and her beautiful work at Amphora Designs. Carol is leading our Barcelona Beadventure. She and her family (son David and daughter Daniela) spent 8 happy years living in Barcelona as her husband Salvador’s job required an expatriate assignment (NOT a hardship post!!). Combining beads and her love for Barcelona is a dream come true and she can’t wait to show you many of her favorite places to see, shop, and eat!! Four years ago Carol stumbled upon City Beads in Chicago by bizarre coincidence at which she took her first class and became an enthusiastic member of the “City Beads Tuesday Beading Group.” Carol and Salvador recently moved from Chicago and now divide their time between their home in San Juan Capistrano and Salvador’s family home in Queretaro, Mexico. Carol works part-time remotely as a Contract Analyst for Siemens Power Generation where she reviews, drafts, and negotiates steam and gas turbine contracts. Carol speaks excellent Spanish (though not Catalan!) and feels that Barcelona, especially with its fabulous Gaudi architecture, will be a completely unique experience and can’t wait to see what Gaudi-inspired project Laura has in store for us! What Others Say About Their Beadventure . . .
Of course, travel to an exotic location can be exciting any time, but why not get even more out of your next trip by joining us on a Beadventure. Let us be your guide as your creativity is inspired and you experience the culture and history of places you have always wanted to visit. Here's what some of our travelers have said about their experience on a Beadventure . . .
"We had such a wonderful time in Italy. We had some adventures at the beginning that added to the fun, and the rest of the trip lived up to our expectations to the utmost. Maggie is such a sweetheart and took care of us so well. Her love of Italy, and in particular Naples, came through loud and strong. I look forward to going back to explore more. Guilia and the Villa were more than fabulous...so gracious and comfortable. The food was simply amazing. I have developed a new understanding and appreciation for Italian food. I feel that we have made some lifetime friends from this trip." "I just returned to Savannah from the Providence Beadventure trip late last night and wanted to compliment the job that Doris did as our hostess. She was extremely pleasant and accommodating to everyone's "whims" which is a very hard job considering all the different personalities of our group. She had interesting dinners, guests, side trips, etc. planned and they were all very informative and enjoyable. It was so nice to have someone drive us around and not have to worry about busses, etc. and she did an excellent job with that chore. I learned a lot from both her and the other participants. I'm so glad I joined Beadventures in this outing and look forward to joining you on another trip sometime in the future." "Your knitting in Ireland workshop was superb!!! Di Gilpin is a fabulous teacher--not only because she knows her stuff, but because she inspires and nurtures creativity in all of us. Learning how to create our own designs and patterns and knit "outside the box" was incredibly freeing! Suzie Sullivan's demonstration of fiber art was equally stunning. Your home/our residence is one of the most beautiful homes I've ever been in and I cherish memories of it." “Thanks to Cheryl and Maggie for such a wonderful trip!! I really appreciate all the time and hard work that goes into planning something like this and Maggie's knowledge of the area - knowing Aldo, made it so special." “Our trip to India was for me exhilarating to the senses, gave me a whole new appreciation for the skills that the people have and it helped me to appreciate my own life. Cheryl and Torben very well organized the India trip. Torben was an excellent guide with a fountain of knowledge. It was a wonderful way of experiencing India and seeing the way people work and live. Just when one would think it couldn’t get more exciting, India would give us a new surprise". “Thank you so much for my two weeks in Arizona. The road trip was amazing, especially the unexpected opportunity to watch the Hopi Indian Buffalo Dance. The Tucson bead shows were made much more enjoyable through the help and guidance of you and your staff. Bassem Elias and Jamie Allen talks were fascinating and revealed just what a huge subject the world of beads is. Most of all thanks for the good company and laughter, which made my first visit to America such fun and so memorable."